Looking for that perfect all-natural aromatherapy bath product? One that will keep your skin looking great, is appealing to smell, has actual therapeutic benefits, and doesn’t break the bank? Well, here it is! Sweep aside all those harmful chemically-based cosmetics and make your own organic bath and body products at home with the magic of potent essential oils! 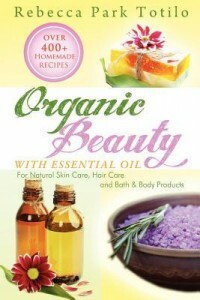 In this book, you’ll find a luxurious array of over 400 Eco-friendly recipes for skin care and hair care such as Exotic Patchouli Massage Oil, Zesty Banana-Lemon Foot Cream and Jasmine Bath Bombs filled with breathtaking fragrances and soothing, rich organic ingredients satisfying you head to toe. I’ve been wanting to get away from harsh chemicals so was excited to review this book. I wasn’t disappointed either, I loved everything about it. It covers not only your body, face and hair, but also your mouth, hands & nails and feet! There are tips, notes and variations throughout the book, and the recipes are easy to follow. I think all the ingredients will be easy to find, the few I wasn’t sure of can be bought online. Anyone wanting to get away from store bought products and learn how to make their own should get a copy of this book. I have one book for giveaway. A print copy is restricted to the U.S. only. If the winner is from the U.S. , they can choose either a print or ebook. An International winner will receive an ebook. To enter, leave a comment below letting me know why this book sounds interesting to you…have you been wanting to make your own beauty products, are commercial products to harsh for your skin, etc. Thanks for taking part in the tour. I so glad you enjoyed Organic Beauty. I hope you have fun making your own beauty products! This is the second review I’ve read and I think it’s one I definitely need. I love the idea of getting away from chemicals and things I can’t even pronounce. I’d love to entered in the giveaway. I am glad you enjoyed Organic Beauty With Essential Oil! I have almost emptied out all my store-bought products and have replaced them with my own…Its good to know what your skin is eating. Thanks for the review! This book would be helpful and a wonderful resource. Thanks for your giveaway. I have always believed nature provides us with what we need. This sounds like a great book! Thanks for the giveaway! I would LOVE to have this book. I have started making my own skin products and I love the results so far. I would love to learn more! I’ve been looking into using natural products and currently use coconut oil for night cream. This sounds like a wonderful book to experiment with. I need this! I sold Mary Kay for years but my 3 year old has allergies and sensitivities and it has made me want to change the makeup I use! I would love to win a copy of this! I thought it was a great book!